Reviews Coming at YA (*Kids Too*): Max the Brave Blog Tour! Ed Vere is an author, artist and illustrator with a long track record of success in the picture book category. 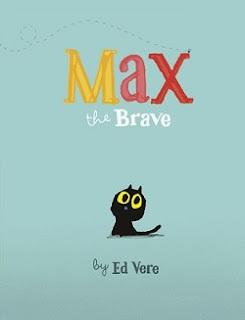 Max the Brave was named one of The Sunday Times’s 100 Modern Children’s Classics. His book Bedtime for Monsters was shortlisted for the 2011 Roald Dahl Funny Prize and Mr Big was chosen by Booktrust as the official Booktime book for 2009 (and was distributed to 750,000 British schoolchildren making it the largest single print run of a picture book). Vere was the World Book Day illustrator for 2009.